The College of Education and Human Services (CEHS) is an influential force preparing and inspiring students, graduates, faculty and staff to positively impact the complex educational, human service and leadership needs facing our communities and our world. Our college is unique in that everything we do helps enrich and save lives and we do this through the work of our four academic departments: Teacher Education, Kinesiology and Health, Human Services, and Leadership Studies in Education and Organizations. Supporting immersive and experiential learning across all disciplines to best prepare students to make an immediate impact in our community. Promoting innovation in teaching and learning that opens pathways to meet the needs of a demanding and ever-changing workforce. For Dean's discretion to include, but not limited to Faculty travel; reassigned time for faculty research, writing grants, or developing new course or programs, stipends for graduate assistants who assist faculty with special projects. Donor restrictions state fund should not be used for student scholarships. This fund helps with students and HPR program expenses related to the Athletic Training program in the College of Education. To support the Conversations for Change (C4C) program. This program is training WSU addiction counseling students through direct client interaction. C4C is a community partner initiative to reduce opiate overdose deaths, related crime, and the stigma associated with addiction in addition to training and preparing future addiction counseling workforce through direct client interaction. This fund was established for the operation of the pilot El Puente Learning Center outreach project. This fund was established to support the needs of the Human Services Department, at the discretion of the chair. To support student-centered initiatives benefiting the Student Affairs in Higher Education (SAHE) degree program. This fund was established to support needs of the Leadership Studies in Education and Organizations Department, at the discretion of the chair. The SEEDS program is a collaborative among school gardens in the Dayton metro area, cultivating a living laboratory for learning and innovation. To support the scuba program. This fund supports Student Affairs and Higher Education students (SAHE) as seen fit by SAGA Board and SAHE Directors. This fund was established to support needs of the Teacher Education Department, at the discretion of the chair. To provide assistance to students enrolled in the 2018 (Faculty-Led Ambassador Program) United Kingdom: Community Accessibility for People with Disabilities in the UK, attached to the RHB 3640 and RHB 3710 Courses. This fund was established to support urban literacy institute programs. Support any costs associated with the WSU Network for Educational Renewal conference. To help undergrad rehabilitation majors with practicum expenses, e.g. transportation, baby-sitting, insurance, or anything hindering their practicum experience. 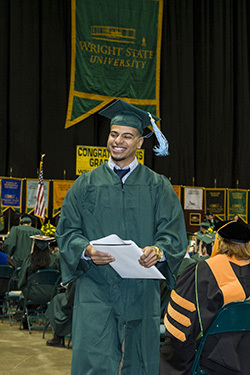 This scholarship supports Early Childhood Education majors who have obtained a minimum gpa of 2.5, and continues the tradition of excellence at Wright State in honor of the lifelong commitment of Angeline Owens Combs to educating children. This scholarship supports Middle Childhood Education students in the College of Education and Human Services in honor of Anthony and Deborah Holbrook. This scholarship supports full-time students enrolled in the College of Education and Human Services. This scholarship is for Early Childhood Education majors who have obtained a gpa of 3.5 and have completed 45 hours of course work at Wright State. The Haverstock Scholarship is an academic scholarship awarded to candidates that have been accepted into the CTE program . The goal of this scholarship is to provide tuition assistance to CTE candidates in recognition of full-time teaching employment as well as a candidate's ability to role-model academic excellence and professionalism, serve the CTE teaching profession by participating as a student organization advisor, and complete the CTE licensure/degree program within an expeditious timeframe. This scholarship was established to support graduate student research in the College of Education and Human Services. This scholarship was established by the Dean's Advancement Council under Dean Harris's leadership to support students in the College of Education and Human Services. This scholarship was established by the Golden Key National Honor Society and Mrs. Berry, in memory of David Berry. This fund is for full-time College of Education and Human Services students. This scholarship supports students in College of Education and Human Services doctorate program in Organizational Studies in honor of William C. & Myra Rowe. This scholarship supports students enrolled in the Early Childhood Education program. Established by Jose "Rafi" Rodriguez Samalot as a tribute to his mother Estilita Samalot from Isabela, Puerto Rico intended to support students majoring in Rehabilitation Services with a minimum GPA of 2.75 on a 4.0 scale. This scholarship supports students in Health and Physical Education majors. This scholarship supports graduate students with financial need who are majoring in any of the Intervention Specialist field. This scholarship supports Intervention Specialist majors. To support Adolescent and Young Adult or Middle Childhood (gr 6-12) students in education programs that lead to licensure in one of the core academic area: English/Language Arts, Math, Science, Social Studies who have expressed intent to teach in a Title I school district and/or one serving students from underrepresented populations. This scholarship supports non-traditional full or part-time students enrolled in the College of Education and Human Services. Non-traditional students are defines as those who have a five-year gap between high school and college. This endowment scholarship supports students in the Initial Licensure Middle Childhood Education (MCE) Graduate Program in the College of Education, Dept. of Teacher Education. This current use spendable scholarship supports students in the Initial Licensure Middle Childhood Education (MCE) Graduate Program in the College of Education, Dept. of Teacher Education. This scholarship supports students in teacher education pursuing a career in teaching Social Studies. This scholarship supports Kinesiology and Health majors who have attained a minimum 3.0 GPA and demonstrated financial need. This scholarship supports students in Teacher Education majors. This scholarship was established to help support for African-American students with a major in Early Childhood Education. Recipients must be in good academic standing with a minimum GPA of 3.0. This scholarship supports full-time students in Athletic Training majors entering their third level of the program. One of the college’s top funding priorities is increasing the dollars available to our students through scholarships. Currently, more and more of our students must borrow to meet their educational expenses. Establishing a scholarship or fellowship can be a most rewarding way of giving. A named scholarship or fellowship may also be a simple and practical means of honoring or memorializing a friend, colleague or loved one. By combining your gracious support with the College of Education and Human Services, we can help ease the financial burden of our students for the future. To find out more about creating a scholarship for CEHS students, please contact the Wright State University Office of Advancement. "The compassion and generosity of Wright State University faculty and staff are legendary. My wife and I are honored to be a small part. We feel it is so important to not only pay back those who have preceded us, but to pay forward to those who follow."